We gathered the average cost of living figures for 60 major cities around the world… Discover how the average Americans iPhone can go from being an everyday commodity to a life-changing payday. HOW FAR WOULD YOUR iPHONE’S VALUE GO? With people paying their phones off monthly it’s often easy to forget that the cost of flagship handsets are now often breaking the $1,000 mark. As a cell phone trade-in website, BankMyCell wanted to provide data to show people how valuable their device is in comparison to the general cost of living in price-conscious markets. The table below shows you just how many days’ wages after tax you would earn trading in three popular iPhone’s at the 256GB size in 60 different countries. The trade-in figures are taken from BankMyCell for the mid-tier storage size for all phones being ‘carrier unlocked’, city/country specific figures are from cost of living aggregator, Numbeo. HOW MANY DAYS WAGES WOULD YOU EARN IN 60 COUNTRIES? If the average number of days people work a year is around the 240 mark (minus personal/public holidays), selling an iPhone XS Max 256GB would earn the average American 1.66% of their yearly salary after taxes at 4 days wages. Selling an iPhone XS Max 256GB would earn the average person living in Cairo, Egypt 30.29% of their yearly salary after taxes at 72.7 days wages. Selling an iPhone XS Max 256GB would earn the average person living in Southampton, Bermuda 1.04% of their yearly salary after taxes at 2.5 days wages. We took what will be one of 2019’s most popular traded in iPhone’s (iPhone X) and compared its resale value against cost of living figures for survival and recreational costs in best/worst case scenarios. 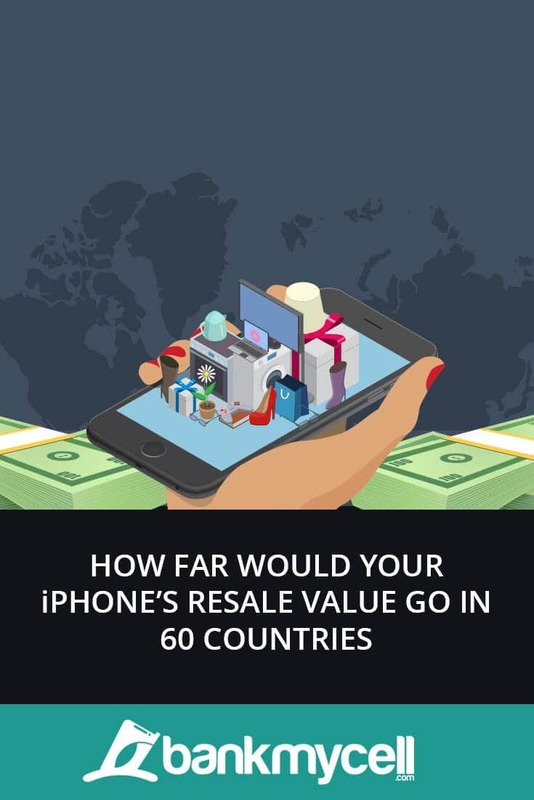 Essentially, we can see extremities at each end of the spectrum if you were to repurpose your iPhone’s value in a major city from the 60 countries used in this study. How many times could you eat out at a reasonably priced restaurant in a major town or city? The comparison for meals out is monumental, you could dine in a restaurant every day for almost a year in Colombo, Sri Lanka at 276 visits for the cost of an iPhone X. However, in Southampton, Bermuda you would barely get past 2 weeks at 16 restaurant meals. Switzerland (Bern), Iceland (Reykjavik), Italy (Pisa), Luxembourg (Luxembourg). Bangladesh (Chittagong), Pakistan (Islamabad), India (Gujarat), Vietnam (Hanoi). How many times 0.5L domestic beers could you buy in a major town or city? Selling your iPhone X could get you 585 domestic beers in Hanoi, Vietnam compared to only 24 in Reykjavik, Iceland. Again, these figures are quit astounding, where you’ll be able to get 24 times the amount of beers in Vietnam compared to Iceland, letting you buy a beer every day for over a year and a half. Norway (Oslo), Israel (Tel Aviv-Yafo), Finland (Helsinki), UAE (Abu Dhabi). Ukraine (Kiev), Russia (Khabarovsk), Colombia (Bogota), Ethiopia (Addis Ababa). How many times days or months could you rent an average 1-bed city center apartment in a major town or city? The value of your iPhone X would not go that far in Hong Kong, where you would be able to rent a reasonable 1-bed city center apartment for only 5.7 days. In Gujarat, India you’ll be able to rent for 28 times longer at 5.4 months, putting a roof over your head for almost half a year. Luxembourg (Luxembourg), Bermuda (Southampton), Israel (Tel Aviv-Yafo). Croatia (Zagreb), Egypt (Cairo), Bangladesh (Chittagong), Mexico (Guadalajara), India (Gujarat). How many months could you cover your utility bills in a major town or city? The utility bills costs include electricity, cooling, heating, water, gas, and garbage. Daily wages after tax are taken from Numbeo figures in dollars (2018 year end). Working days is based on an average of 20 working days in a month across all territories.